Travel to San Jose is no problem. I board a Delta flight from Columbus to Atlanta, and then connect to San Jose, where I meet Jeff at the airport. The drive to Uvita is an interesting initial look at Costa Rica. It’s definitely poor, but I’m not seeing the type of crushing poverty that seems pervasive in Jamaica or parts of Mexico. This feels a bit more like Peru. Jeff stops at a bridge where massive crocodiles lounge in the water below. 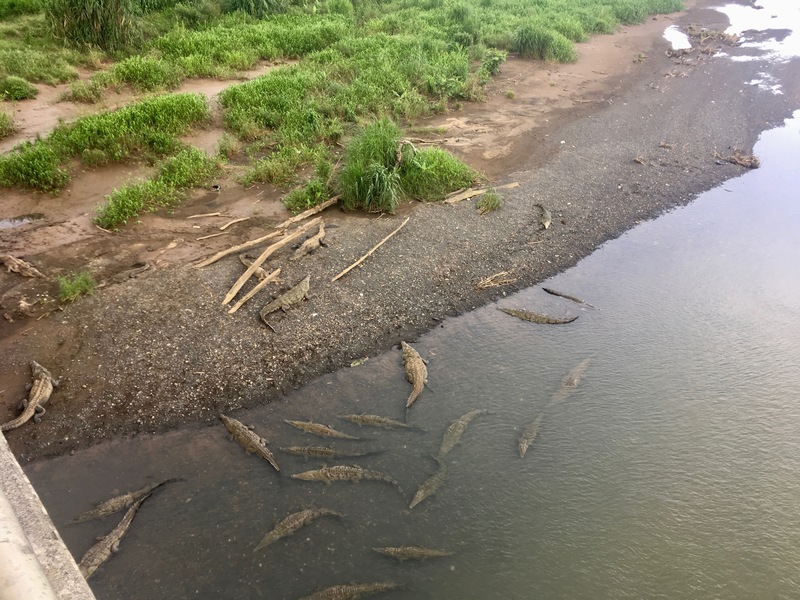 There’s a “Crocodile Cafe” on one side, and a lot of people walking out on the bridge over Rio Tarcoles to see the crocs. I’m a bit dubious as I join the other tourists on the bridge, but once I catch sight of the crocs, my wariness shifts to wonder. They are massive, strewn about the river bank below like a reptilian version of Pick-Up Sticks. 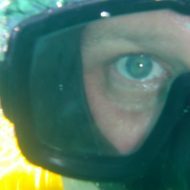 I’ve seen a lot of gators in the Florida Everglades and even have paddled my kayak respectfully past them in Central Florida. But nothing this size. 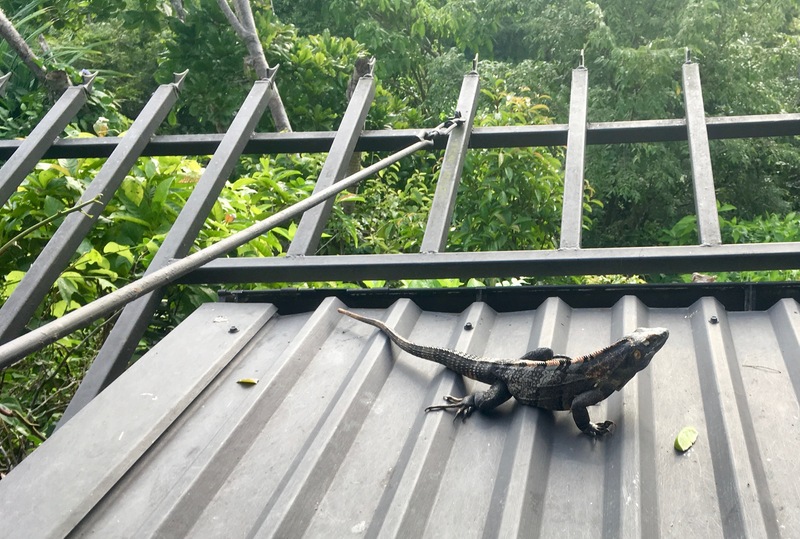 After I get my fill of crocs, we stop for lunch at a hotel perched high above the ocean. Beautiful view, good salad and seafood soup. This is where it fully dawns on me that I’m not in Athens anymore. Seafood is back on the menu. Fresh and delicious. The waiter comes by as we hear a sound in the forest below and says, in English, “Listen. It’s the toucan.” We hear him but don’t see him. It isn’t long before we get another parrot encounter. A pair of macaws squawks by overhead, alighting in a leafless tree with a great ocean view, where they continue raising hell and being parrots. Then a massive iguana emerges not far from our table. This clearly isn’t his first time approaching diners at the restaurant. Jeff tosses him a slice of lime, but after a lick or two the iguana realizes it’s not what he’s after. The drive along the coast is stunning, and it isn’t intimidating (though I’m not driving; Jeff is). We don’t arrive in Uvita until dark because of our stops to see crocodiles, gawk at macaws and eat lunch. As we drive, we see several other pairs of macaws on the wing. Uvita isn’t exactly what I expected, but it has a lot of potential. It sprawls along the coast highway for several kilometers and lacks a town center, but there appears to be a lot of restaurants, etc. I’m just not sure how walkable it will prove to be. Jeff’s PurUvita resort is impressive but it’s very much a work in progress. The Treehouse, where I’m staying, is pretty much ready for prime time. No air conditioning yet in the rooms, though the Treehouse is cool and I sleep well. I already love the equal portions of day/night you get this close to the Equator. The sun was down by 7, and after talking for a bit at the open-air bar/kitchen area, I turn in at about 9. Jeff is a good guy. This is his project, and apparently his wife, Laurie, came to it with reservations. I totally understand that. Lara and I have similar discussions in these situations. But Jeff is doing this smart. He’s not incurring debt. Instead, he’s doing it incrementally, which slows the process somewhat but makes it much more fiscally sound. I awoke before sunrise, and I’m sitting here now at 6 a.m. watching the day break and listening to the various and strange sounds surrounding me. 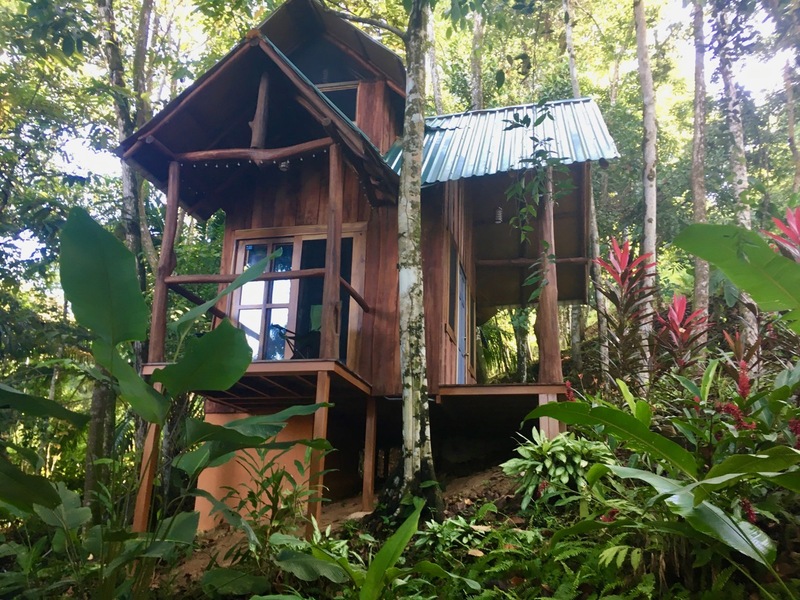 There’s a constant insect buzz punctuated by frogs, birds and what sounds like a braying donkey at about 5 a.m. Jeff says toucans come on the property. There’s a rambutan tree on the property that attracts them, and there are howler monkeys, too. I’m looking forward to seeing a new array of wildlife, but I’m hoping to give the resident pit vipers a wide berth. Rambutan is interesting. It’s red and prickly looking, a bit menacing actually, but it’s not as thorny as it looks and you can peel it open with your fingers. 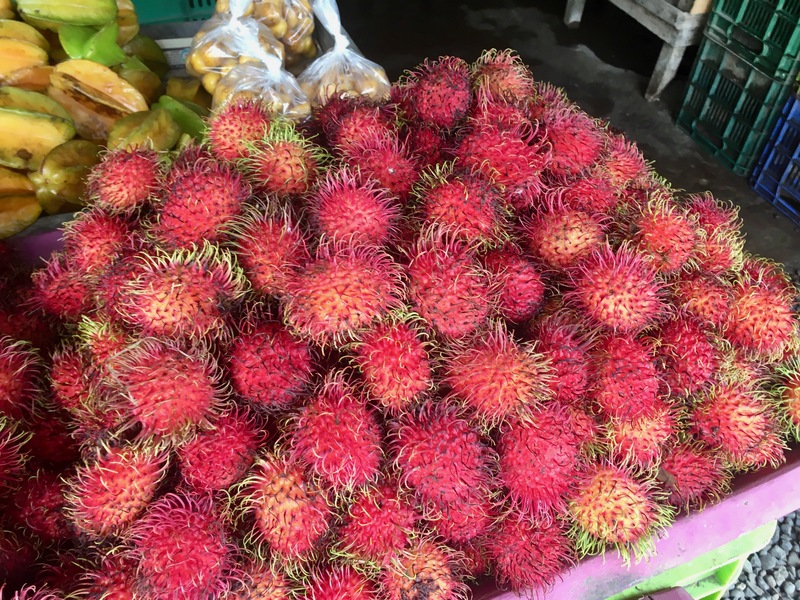 We stopped at a series of fruit and vegetable stands near Rio Tarcoles on the way in yesterday, and one of the vendors saw me eyeing the rambutan warily. He told me the name of it, then pulled one open, revealing a soft fleshy inside that was delicious. A seed about the size of an almond is nested in the flesh. We ended up buying an assortment of fruits at the stand, including a bag of rambutan.